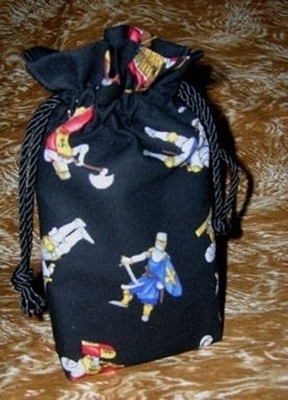 Double Draw Tarot Bags - Knights Double Draw Tarot Bag - Tarot Bags, Tarot Cards, Cloths, & More! Here is a highly masculine bag for our male tarot reading customers. On this bag, armoured knights prepare to defend their countries using swords, maces, and bows. 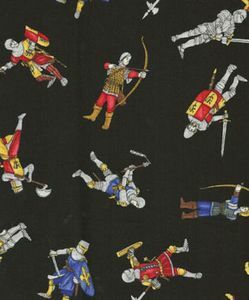 All of the Waite decks and Waite-clones would coordinate well with this Middle Ages-themed bag because of the armoured knights or princes in those decks. Colors scheme: Black background with knights costumed in yellow, royal blue, gray, red, brown, and black. Size: The Regency-style tarot bag is 7-1/2 x 5 x 1 inches. It fits most standard sized tarot decks that are up to 3-1/4 x 5-1/2 inches. There is an one-inch ruffle on top and an one-inch gusset (tote style) at the bottom. It is made of cotton and closes with double drawcords made from 34 inches of twisted rope decorator cord. The tips of the cords form small tassels.